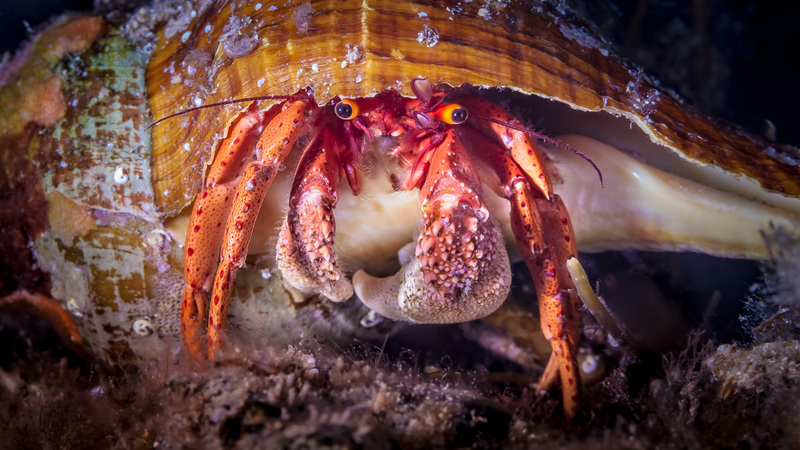 I immensely dislike the expression ‘low hanging fruit’ but when it comes to naturally photogenic, patient, and easy to photograph critters then hermit crabs fit the category. This Hermit Crab (Paguristes frontalisi) under Edithburgh Jetty is wearing a shell that is probably a new acquisition and watching it struggle around with a shell two sizes too big borders on the comical. Looking at the way the leading edge of the shell has been cracked away I’d say the most recent tenant made some futile attempts at home renovation before abandoning it in search of a larger home. For now this guy has room to shake, rattle and space to grow.